The newest member of the award-winning Trance X family is this all-new 29er. The premium ALUXX SL frameset has been tuned to match the performance benefits of lager 29-inch wheels. At its core: proven Maestro Suspension plus a host of frame technologies including the OverDrive 2 steerer tube and PowerCore bottom bracket. Whether you’re climbing or descending, pinning it at speed or crawling through technical terrain, there’s no better way to own the trail. I have a Trance X 2016 with the carbon fiber main triangle. The bike is somewhat sluggish to get to speed, but carries it well once rolling. I ride a combination of single track, fire roads, and pavement from my house in Northern Utah. The dealer I bought the bike from was bluntly dishonest. I really like the bike, wish the snow would melt (not for several months now) so I could ride it again. For 70 year old man (me) the lowest gear could be lower, I realize that is highly personal. I spent a lot of time researching this purchase, comparing specs, taking test rides, and reading on-line reviews. I was looking for a bike that could handle typical XC terrain but still be a competent trail bike. With lightweight aluminum frame, full Fox suspension, XT group-set, dropper post and tubeless-ready rims/tires, this bike seemed to fit the bill. Giant specs a Fox 32 Float 29 CTD fork and Float CTD rear shock w/Boost Valve - the full-suspension frame provides 120mm of travel and the CTD platform makes it easy for me to set up the suspension for just about any terrain I’m riding. The XT 2x10 group-set with 11-36 cassette means plenty of t of gearing options for all conditions and, for stopping, the XT brakes are among the best I’ve tried. The Giant Dropper works well but secures the seat with a single bolt – the seat sometimes moves when landing a big jump. The dropper also has a 12mm rear offset that stretches you out a bit on the bike. Combined with the stock stem of 90mm, I found the fit a bit awkward – the medium fit me a bit small but had good reach and the large was a good fit but had a long reach? I opted for a large but swapped out the stock stem for a Giant 70mm Contact SL stem – 20mm may not seem like much but it made a big difference in fit and feel (and is very light). Speaking of stems, because the X29 uses Overdrive2, with a 1 ¼ head tube, you are limited with stem choices, which is a pain. The Giant P-TRX wheel-set is relatively light and strong and tubeless ready - I switched to tubeless after about a month of riding (the stems are included with the bike) and this dramatically improved traction, made acceleration much better (important with a 29er), and increased resistance to punctures. The suspension is easy to dial in, I typically run at about 25% sag, front and rear, with the front rebound set a click or two faster than the rear. I ride in Southern Ontario (Canada) - lots of short, steep climbs, rolling trails with lots of roots and ruts, small jumps/drops, and quick descents. I do most of my riding with both the fork and shock in the ‘Trail’ mode. For longer or more technical descents I’ll normally use the ‘Descend’ mode on the fork and, occasionally, I will lock out the rear shock for long climbs (not a lot of those). I have found that the fork does tend to blow through its travel on big jumps/drops – increasing air pressure helps but makes the suspension a little stiff over the smaller bumps. Also, the fit between the stanchion and bushings loosened up pretty quickly and I was concerned about premature wear (not uncommon on these forks - more on this in a bit). The rear Float CTD shock is great. In addition to the CTD platform, it gives you a lot of rebound adjustment and in ‘Trail’ mode you have 3 LSC settings (1-3) to choose from – I ride mostly with the LSC set on ‘1’, which provides complaint handling and minimal pedal bob. Most of the newer shocks have adjustable compression in the ‘Open’ or ‘Descend’ mode but since I do most of my riding in ‘Trail’, I like this better. I found the bike fast and stable, it rips through most terrain and gives me a lot of confidence. The suspension keeps the wheels planted and the bike handles great but the bike is not as ‘flickable’ or ‘playful’ as some other ‘Trail’ bikes – in its defense, these bikes tend to have more aggressive geometry, smaller (27.5) wheels, and longer travel suspension. On climbs, the bike handles well and the 29er wheels will get me over any obstacles with ease. The off-set on the dropper does shift your weight rearward though and that means I have to really get over the front wheel to keep it planted. At a little over 28lbs though, the bike gets up inclines pretty quickly and having the 2x10 set-up definitely helps. The bike descends very well and handles small jumps and drops with ease - this is no DH or Enduro bike but it will get you down the hill with speed and stays stuck to the trail. The chain stays are pretty short for a 29er but with a conservative head angle and long wheel base the bike does struggle in tighter corners. There is no way around this except maybe a fork with more offset. Still, the bike corners well, just not great. The stock P-TRX wheels are light and strong, as mentioned, but they have a little flex in the real tight stuff. Personally, I didn’t think this was an issue but some will find it annoying. As for braking, the XT hydraulic units bring this bike to a quick stop, with no fading and practically no squealing. Admittedly, I don’t ride any sustained descents but the brakes have worked without fail, no air bubbles and no bleeding has been necessary other than regular servicing. The bike has held up to repeated use, the frame, wheels and group-set have all performed extremely well, with few exceptions. After 2 seasons, the Giant dropper had seen better days – the action was still relatively smooth but the system had dirt and debris trapped inside that caused a ‘crunching’ sound when actuating it! I could have gone with the new Giant Switch dropper (it now has zero off-set and 2 clamping bolts) but went with an aftermarket dropper instead. Regardless, with no off-set, my weight is placed more forward for better climbing but also gives me more room to hang off the back of the bike. Honestly, I couldn’t believe the difference it made! Also, as noted, I experienced a poor fit between the fork stanchions and bushings and after 3 seasons of use my fork was toast – it had developed excessive play and had allowed dirt past the seals that ruined the coating on the stanchions. I could have rebuilt the fork but elected for a newer model with more adjustment, better reliability and a bit more off-set for better slow speed steering. Also, I upgraded to a Shimano 1x11 XT drive-train. Although I will admit that I sometimes miss the gearing of the 2x10, the 1x11 is lighter (over a pound less), less complicated and easier to use and it frees up space on the left side of the bar for my dropper. At last check, without pedals, the bike weighed in at 27.45 lbs – pretty light for an aluminum FS bike! So, the Trance x29 is not perfect. However, with the frame, suspension, group-set and dropper that it came with, I think it was an excellent value. The bike is fast, stable, handles well and is a lot of fun. I have owned the bike for over 4 years now and can see a few more years of fun ahead of me. Great bike, great buy!!! Stock fork is slightly flexier than the frame, under damped as well. Does not match the suspension of the frame. Press in bottom bracket cups creak when bike bottoms out on drops or jumps. Stock stem is tiny bit too long for aggressive trail to AM riding. Review is on med 2014 "Trance X 1 29er" will cover the set up then impression with new parts. Bike was ridden with stock parts exp bars and stem for the 1st year. Bike is noticeably faster than any trail bike I have owned or test ridden before. With stock wheels it does not accelerate poorly but not lighting fast either. On well known trails this was not a problem, it was easy to carry speed both in corners and straight lines. At speeds the front of the bike does flex more than I would like over off camber roots and rocks. Work around is to pick up front wheel up and over. The rear wheel/ frame has no problem dealing and smashing through obstacles. Bike has bit of dual personality at lower speeds it hugs the ground, slightly difficult to hit smaller kickers on the trail. 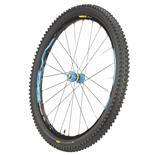 Could be the bigger 29er wheel just rolling over same obstetrical where 26 can use it as a kicker. At higher speeds bike still glides over small obstacles but now likes to take off on med sized obstacles, in a good way as now the bike can be jumped with ease and tossed around into new lines. Bike does behave better with more forceful input than genital suggestion at any speed. However at very high speeds the bike is actually is too stable and no longer dance on the trails. A fright train behavior is not a problem on a DH bike with 8 + inchs of travel but with only 4.7 and 5 inch in the rear bike does become slightly more dangerous. This is on down parts of AM trails that equates to bike park black. Stock fork also horribly out of place in real med to big mt terrain. On larger DH type of kickers and jumps frame stiffness is no longer adequate but no worries the fork long gave out at this point. In my mind the wrong bike for anyone constantly riding big AM terrain. With new wheels that is 450g lighter than stock bike accelerated and turned faster, the fright train feel is reduced at speeds as well. At this time felt it was appropriate to increase the fork's travel from 120 to 140 now bike is lighter and less pig-ish for lack of better word. With new wheels but duller steering the bike felt about the same on flatter trails. On the steeps the bike felt noticeably happier dropping into aggressive AM trails. I am not a sprightly climber both technically skill wise or mentally. However my thoughts are the bike does wheelie a bit more than I would like, even though front wheel does no wonder. This is with 120 or 140mm fork, something maybe off with geo. Something of note for people who likes an aggressive climbing trail bike. Also of note climbing grip is more than adequate but not best of best, only slightly better than average for bikes I have ridden. Braking and corning grip over rough and slick terrain is sublime. When it does break traction it is predictable and progressive. The Nobbie Nic are quite good but grip is greatly contributed to suspension and possibly wheel size. Overall very happy with the bike and stock parts for their intended use. Recently bought full carbon 650b bike costing twice as much with upgrades. I would not say it is any better than this bike. 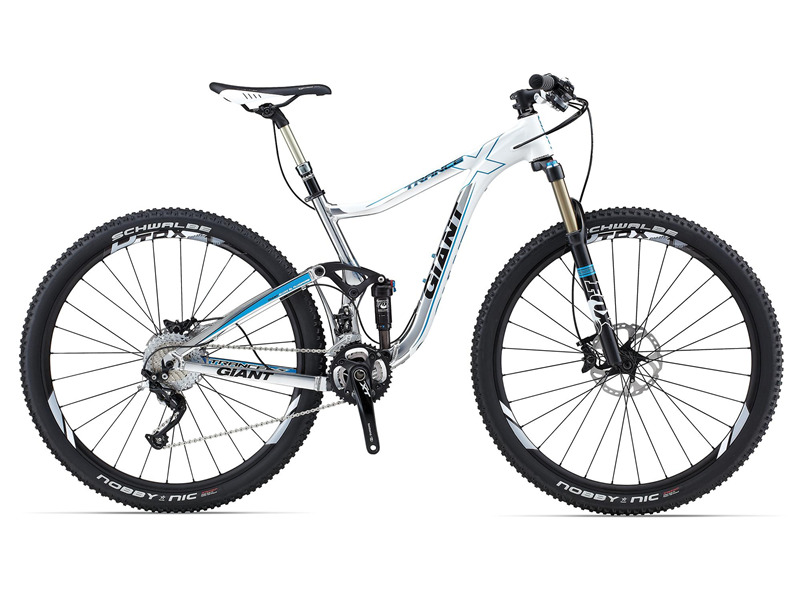 Shame Giant is discontinuing the Trance X 29er. In my mind their best "trail" bike. New Trance 27.5 in my mind is more "AM" than "trail". I'm riding the giant trance x 29 0 since one year now. Unluckily I dislocated my elbow while I was waiting for the arrival of my new bike. So I was even more surprised that even after a few weeks of riding this bike and getting a feel for my very weak arm, I was able to clear some trails that I could not ride through with my old bike (giant reign). To me this bike has no real weakness. I think the things that I changed were more a matter of taste than weakness. I put on a shorter stem, ride it tubeless with 2,4 tires up front and the 2,25 nobby nic on the rear end. Now it fits me and my riding style perfectly. The dropper post works just fine but I often want more than 100mm of travel. The tires are great but they wear down quickly. You should definitly test ride this bike to see which size and stem fits you well. Maybe some people would like to see a 34 fork on this bike, but I'm happy with the 32 version. So those 'weaknesses' are not really a concern. At least to me. The specs are great for a bike in this price segment. I got a great offer from my local bike dealer. Great support and service from the dealer and giant in general. You won't have many warranty issues with giant. The suspension is a masterpiece. Simple as that. This bike is superfast and safe going downhill. I think that me and the people I ride with are almost on the same level skillwise but I can't remember a trail which I didn't come in first since I fully recovered from my injury. It is so much fun to ride. I would never go back on a 26" bike. The frame is very light. I ride the trance tubeless with bigger tires up front and with flat pedals. It comes in at 13,00 kg. The big wheels, suspension and this weight make it a great ride for all day biking. 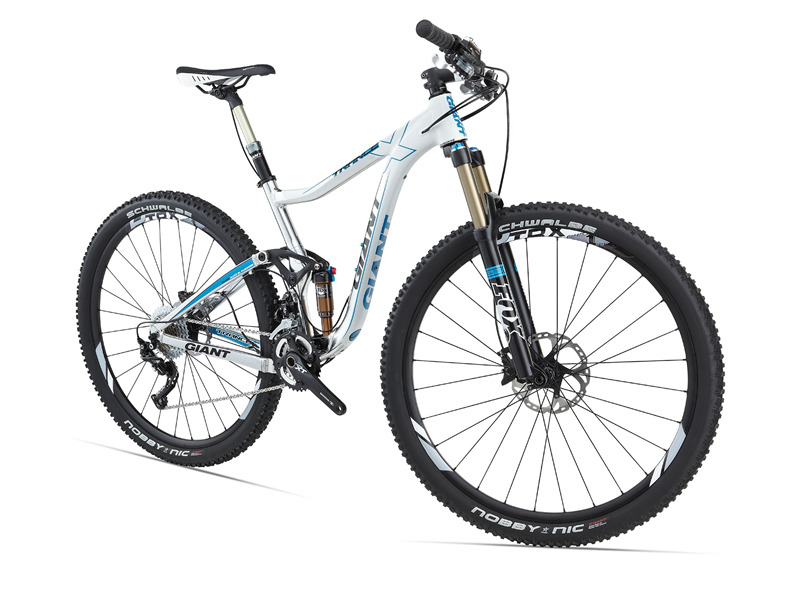 To me this is one of the best allmountain bikes you can get. If you get a good deal --> go for it. If you can't --> still go for it. It is absolutley worth it. Dialed in geometry makes this bike a blast to ride. Haven't found one. This bike works extremely well out of the box. With time you can upgrade or change some parts to suit your own riding style. Been riding a Santa Cruz Blur for the last decade and wanted to try something new. After much research I narrowed it down to two bikes, the Tallboy and the Trance. I'm a huge fan of Santa Cruz and the Blur is an amazing bike and I have no doubt the Tallboy will also perform well. But I wanted to try a different suspension system other than the VPP. My decision to go with the Trance X 29r 1 Large frame was rewarded the minute I hit the trails. The immediate thought that came to mind was, this bike feels exactly like my old Blur but on steroids. I was concern going from a 26er to a 29er but does concerns disappeared very quickly. The Maestro suspension felt just like the VPP but more consistent and compliant without the pedal bob. The trails I ride are tight technical single track littered with roots, rocks with short technical climbs. The Trance ate all of it up without hesitation and asked for more. If you are thinking about getting a 29er, the Trance blurs the line between 26er's and 29er's and I highly recommend you give this bike serious consideration. I know Giant is hyping up their 27.5 line up and that's fine, but I think they are making a big mistake in talking down their 29er's. The Trance is an amazing bike, hope they keep it in their line-up for a long time. 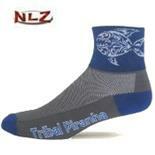 Technical climbing and obstacles, downhill stability. Not the fastest thing out there. I've owned numerous hardtail 29ers, a Trance X 26 and a Stumpy FSR 29. The overlying trait of this bike is simply how good a trail bike it is. It's a very good climber, more so if the climb is rough. And it does an amazing job in our rock gardens and rock rollers, it offers supreme confidence in technical terrain. I wasn't a bad rider before, but this bike has helped me to another level. We don't have big jumps around here but it does an admirable job in the air. 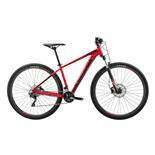 You can charge steep and rough downhills pretty hard, the bike does an admirable job sorting it all out for you. Pedaling efficiency is definitely improved over the 26er version, very little bob and it transfer power standing quite well. Negatives are it simply isn't "fast". I set numerous personal records on flatter terrain with the FSR that I'm pretty sure I cannot beat with this bike. Similar setup, same weight, but it just doesn't have the same boogie. Which is fine, the Trance crushes the FSR when it gets gnarly. I did experience the complaint that the bike uses it travel easily. I was on a slick, steep rock face that I chose to bomb rather than roll, and bottomed the fork. It didn't bother me but I've been on that before and never had that happen. I also have some side to side play in the dropper, but it currently functions fine so we'll see how it holds up. I ditched the brakes, wheels, shifters, tires, and cranks the first day. I think the X9 RD is a solid offering and the X7 front is fine. I like how the Fox stuff feels, although I did mention the fork bottoming overall I'm very happy with the suspension's overall effectiveness. It performs especially well in rock gardens and rougher terrain, allowing you to keep momentum and make the moves. Could do without the OD2 steerer, limits stem choices. Although the rear end never felt like it was lacking, a 142 axle would be a nice. I changed the bars to a flatter bend which I prefer. I'm 5'10" with a 32 leg and long arms, the Medium fits very well, much better than the 26 did. Overall if you're looking for an excellent overall trail tool that excels when it gets rough, this is the bike. Quality, pedaling, suspension design, short chain stay, light, nice looking(black, grey and green 2013), internal cable routing, 29" inch wheels!!! PF bearing cups, cant go wrong with threaded cups... Choice of stem and handlebar is very important. Custom built from frameset only. 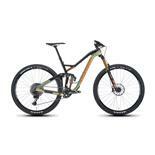 Forget about 26 and 27,5(which is virtually the same) and go for the Trance 29er. Thought my reign was a good AM-bike but this is really an ALL Mountain MTB! Climbs like a goat and descends like a flying carpet. 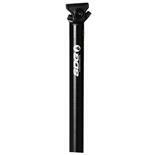 On one 456 carbon 26"
Short seatpost. Nothing else, really for the price. Compared to more expensive models a little heavy, would possibly benefit from a rear thru-axle. Recon fork and Monarch shock a little less controlled than the Fox counterparts. Would like a lockout of the shock. This review is for the 2013 model. I run muddy, rocky and rooty trails in Gothenburg, Sweden. My background is ten years of 26er HT XC style riding of gravel roads and easier trails. After I transitioned to a long-travel 26er HT and then to XC 29er HT:s I evolved a lot. Many riders here choose long-travel, enduro type bikes due to the rough and technical terrain. This is my first FS rig after a bunch of 26er and 29er hardtails. I wanted a robust bike with medium/good-level componentry, too keep costs down both for buying and service. For 2013, Fox has had lots of quality problems so I decided to go for a RockShox equipped bike. My choice was in the end between the Trance X vs the Anthem. Eventually, I decided the extra suspension travel would be worth a slight penalty in weight. I already knew 100mm was too little for my trails and riding. Giant has done a very solid spec on paper and the unanimous good reviews on the rear suspension and low frame weight (Germanys 'Bike Magazin') was what finally made my decision to go for the Trance. I'm 6ft7" (199cm) and weight 210 lbs (95kg). I have an XL sized bike but needed to add a longer seatpost immediately. I bought for a straight Gusset 450mm w/o setback since the seat tube angle is pretty slack. BTW the Giant brochure picture of the 2013 looks really squashed, possibly a M frame. The XL looks long, lean and well proportioned. Riding off, my initial impression is still that the steering is weird due to the slack headtube angle, but it disappears on the trail. It may be because of me being used to the G2 geo on my previous Trek. It's not immediately playful as some bikes are, just very neutral and balanced. Climbing traction is fantastic, cornering balance is really good. When pushing harder and harder, the bike stays secure and there are no vices. On rough terrain, it excels and the absence of chain slap is a big bonus, despite the X5 rear mech. The specification is very sensible - not the fanciest but just very solid stuff. X5/X7 and Shimano brakes do a good job in all situations. I have 4 months of use on all kinds of trails and so far all has been good, rims are straight etc. I mentioned the shock and fork as weaknesses; they do a great job, but that extra suppleness of the Fox is not there. If you have the budget to buy and service them perhaps look at the 1 or 0 build options. Also, the absence of a lockout / propedal may turn you off if you do long climbs. I tried some XC-style trails and gravel roads too and in these situation the Trance is too much bike. Maybe the other build options work better there too. Looking at the 2014 it seems to be Shimano Deore instead of Sram - will work just as fine. In all, a very good bike! 29ers Trek Paragon, Felt Nine 2012 and 2013, Kona Unit. ive only ever had a Trance. started riding mtb in 2007 on a Trance x3 26er. Bought a Trance 29er X0 2014 last week. there is nothing it dont do really well. on steep climbs my 26er got really light on the front so i have always been used to leaning right forward to keep the front down. The 29er is the same. Not a problem for me at all. spec on the 2014 is tops. i cant believe a bike can make such a difference to my style of riding. out of the box ive gone from running at the back of my group to leading the pack. the effort required to do the same trails on my 26 has diminished soooo much. if your in the market for a top bike, this is it. undoubtedly ! Compact geometry / I'm 5' 5" and goes fine with XS. Maybe internal routing from factory could be better. I waited for that bike over a year... I've started to ride it in October and it feels great! I'm riding mountain bikes since 1995 and needed a more "do-it-all" bike. So Trance X 29er was my ride to have.